Everyone has to read this article in yesterday's NY Times Magazine about how we're destroying elephant society, and how the elephants are striking back in alarming ways. I've linked to this before, but The Elephant Sanctuary in Tennessee (mentioned in the article) has this live video feed where you can watch rescued elephants live out their days happily. It's incredibly relaxing. 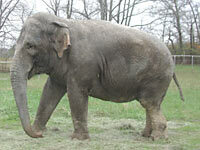 You can also make donations and read the biographies of rescued elephants.